Tent technology has progressed in leaps and bounds over recent years. In the early days one had little choice but to plump for a heavy cotton ridge shelter, supported by almost industrial scaffolding, which, unfortunately, increased in weight considerably if your were unlucky enough to endure a stormy night. Most folk will be able to cast their memories back to school trips, or Scouting expeditions, where the tent accounted for much of the back-breaking weight you had to cart over the mountains and through the glens. Those on solo backpacking adventures often opted for the claustrophobic confines of a bivi-bag in a bid to keep the weight down. How the world has changed. These days tents are so much lighter, making use of nylon and polyester rather than canvas. Standard ridge designs have given way to single hoops and tunnels; space no longer has to be sacrificed to the same extent in the quest for minimum weight. There's now a baffling array of tents on the market, ranging from extremely affordable three-season shelters to expensive expedition base campers. For those on a budget, we've selected five lightweight models designed for backpackers - the Coleman Cobra, Salewa Micra and Wynnster Dragonfly, Mayfly and Mosquito. All are priced at under £150 and they all accommodate two people, while the Cobra, Micra and Mosquito are light enough for solo adventures. The Cobra is a delightfully simple, and lightweight design with some wonderful features. As with all Coleman tents, the fabrics are treated with fire retardant which claims to give you more time to get out should a match go astray and the worst happen. The Cobra has a tough PU coated polyester flysheet with taped seams and this proved to be completely waterproof. The groundsheet is nylon and felt sufficiently tough when pitched on a mix of rough grass and heather. The inner is unusual in that it is almost completely made of mesh, helping keep weight to a minimum. In fact, if the weather's good you can do without the fly and enjoy wonderful midge-free views from your bed! There are just two poles, a main front hoop which gave a good metre of height - sufficient to sit up in, and a tiny rear hoop. Both lock into straps on the groundsheet and the fly is attached over the top, with access via large zipped side doors on either side. The poles are made of aluminium, are shock-corded and break down into a convenient packable length (30cm). There's 250cms of length and 132cms of width, providing space enough for two people. There are good-sized pockets inside and space within the two side porches for kit. Pitching, flysheet first, was quick and easy with the minimum of fuss and the tent felt solid, even in high winds. A nice touch is that the Cobra is supplied in a waterproof canoe-style drybag, although a lighter nylon bag is also supplied. There's also a little repair kit with spare pieces of fabric and a tube of seam sealer. Weighing in at 2.6kgs, the Cobra is a great value three-season tent at just £100. Colour: dark blue. Walkscotland.com was armed with the extremely lightweight (1.9kg) Salewa Micra tent during a two-day trek from Dunkeld to Pitlochry recently. Spurning a night at Sarah's Bothy, we decided to pitch the Micra near a little copse of trees a few hundred yards from the building. This particular tent is very easy to erect and a pre-trip practice session in the office saw it up in just a couple of minutes. The instructions provided are short and to the point and provided in various languages. The three-season Micra pitches inner first and Salewa's system whereby poles (which have screwlock tips for greater stability), inner and outer attach to each other at the four corners mean you can erect it and move it around your campsite before committing yourself to knocking in a single peg. Tension bands make for easy adjustment. It is just large enough to accommodate two (close!) friends at 130cm wide, while there is plenty of headroom (105cm). The tent also benefits from a handy little gear loft attached to the roof which makes an ideal place to put a torchlight, or stow small amounts of gear. Above this there's a mesh panel which allows light in. There's also a good sized porch area for cooking and gear storage. There are two storm-flap covered ventilation panels in the fly at each end which we should have used because there was a fair bit of condensation under the flysheet the next day following an extremely warm summer night. The outer cover was quick to dry, however, and the entire bundle is easy to pack away in its smart suitcase-like soft holdall, while a stuff sack alternative is supplied to keep weight down. While accommodating two people in relative comfort, the weight is light enough for this to be used on solo backpacking trips. The build quality is excellent, as one would expect from a company like Salewa, and the stability was superb in rough weather. Very attractively priced at £129.95. Colour: Forest Green with yellow inner. Supplied with spare material patches for repair. The Wyynster Dragonfly is not dissimilar to the Salewa Micra in its concept, but weighs in over a kilo heavier at 3.3kg and offers slightly less width. It's a good solid design though, standing up to elements with ease and pitching - inner first - is a breeze with colour-coded poles and sleeves. The Dragonfly 2 offers good headroom with a 105 metre height at its peak and near vertical walls, offering a fine feeling of space within. There is plenty of space under the porch too, for gear stowage and cooking. The flysheet is ripstop polyester, PU coated again, and features fully taped seams. The inner is polyester with mesh ventilation panels and the nylon, PU coated groundsheet feels tough enough for pitching on the roughest of grounds. A gear loft is provided. A good, robust and spacious tent for two people but too heavy for solo backpacking. The Dragonfly is also available in three and four person models, should you want to entertain your friends, and comes in a teal/graphite colour scheme. £150.00. Weighing in at the same as the Dragonfly 2 (3.3kg), the Mayfly 2 boasts a tunnel design with twin hoops, one at the front and the other at the rear. It's more spacious than its sister with 110cms of height and an overall width of 180cm, resulting in plenty of room for two people. It's cheaper than the Dragonfly, at just £100. There' s a good sized porch for gear stowage and covered cooking. 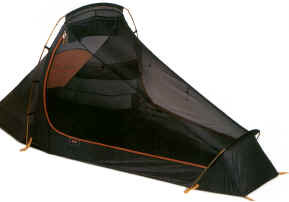 The Mayfly differs from the other models on test in that it pitches flysheet first, which is useful in bad weather. Features/spec as for the Dragonfly 2. Colour: teal/graphite. The Mosquito 2 is ideal for solo backpacking and cycling, but has space enough to accommodate two people. The inner is the same width as the Micra (130cm) and there's plenty of length, the tent tapering at both end, making it feel less spacious than the others on test. Features include a robust, lightweight aluminium hoop pole and pegs, and a fully taped ripstop Polyester flysheet with PU coating. The inner is made from breathable polyester with mesh ventilation panels while the nylon groundsheet is also PU coated to ensure it is waterproof. The Mosquito pitches inner first and erection is easy. Useful features include a gear loft inside. Weight: 2.3kg. Colour: teal/graphite.